Triangular in shape, these bandannas are imprinted with a white border of paw prints. Made of 1 ply 50 / 50 poly-cotton. Use pull downs to select size and add quantities of each desired colors to your cart. The 2 sizes available are based on the longest side of the triangle. Made from the same material as our stock bandannas. 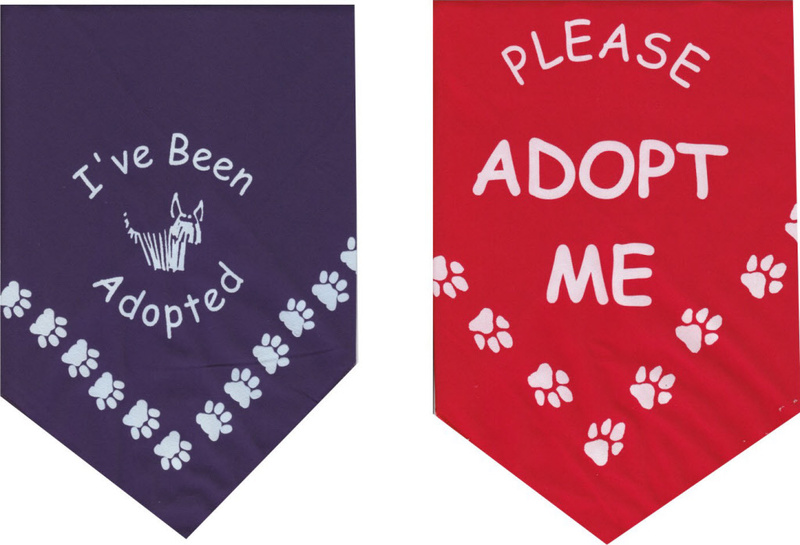 Printed in white ink with paw border with "I'VE BEEN ADOPTED" or "PLEASE ADOPT ME". Great for those adopt-a-thons. 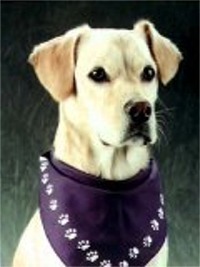 To add a special touch after grooming, surgery or to a new home, send them out wearing a bandanna imprinted with your facility information. Mix and match colors and sizes to equal minimum order quantity. Made from the same material as our stock bandannas, with white paw border and your information. Pricing includes straight type only. For logos, add $20.00 art charge.